Civita Comfort: Made from the same ultra-soft polyester blend fabric as our Civita Day Pack, our sturdy, ultra-light Civita Neck Wallet provides pickpocket security for those who'd rather not wear a moneybelt. For Every Body: Its smooth neck cord measures 40 inches from end to end and is adjustable, so you can wear it under your shirt on your chest, tummy, or shoulder-holster-style. Secure Storage: The main zippered compartment features a moisture-barrier liner — perfect for "deep storing" your passport and rail pass. Easy Access: A second zipper reveals two "easy access" compartments — one for your cash, and one for your debit/credit cards. Relax: When you wear it, feeling a street urchin's hand in your pocket becomes just one more interesting cultural experience. 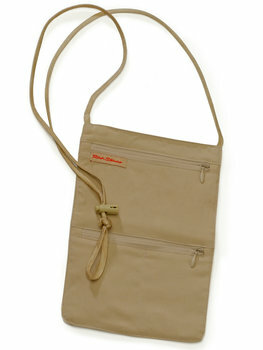 Your Choice: Our Silk Neck Wallet shares the same dimensions and features, but is made from comfortable spun silk. 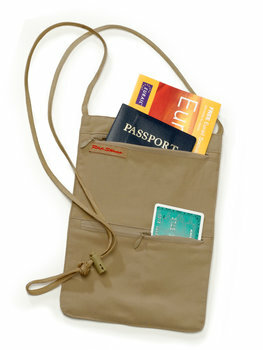 Or, go with our Civita Moneybelt or Civita Hidden Pocket. Dimensions: 5 ¾" x 8"